The Ribbon is Microsoft’s primary user interface gadget. 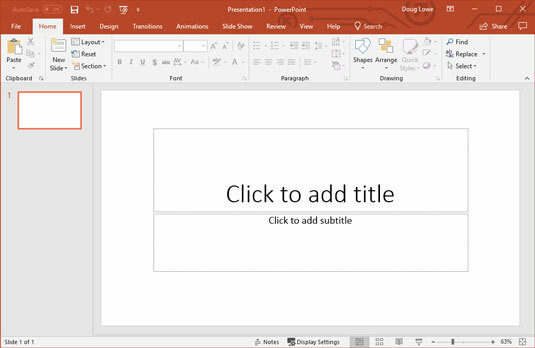 Across the top of the Ribbon in PowerPoint 2019 is a series of tabs. You can click one of these tabs to reveal a set of controls specific to that tab. For example, the Ribbon in this image shows the Home tab. The following figure shows the Ribbon with the Insert tab selected. The Ribbon with the Insert tab selected. Initially, the Ribbon displays the tabs described in the following table. Besides these basic tabs, additional tabs appear from time to time. For example, if you select a picture, a Picture Tools tab appears with commands that let you manipulate the picture. The commands on a Ribbon tab are organized into groups. Within each group, most of the commands are simple buttons that are similar to toolbar buttons in previous versions of PowerPoint.